Demolition At Katch Environmental, we provide demolition services for all types of buildings. Our commercial, industrial, and residential demolitions are done within budget, on-time, and with the highest safety in mind. Thermography Infrared thermographic technology is a non-invasive way of looking inside walls. With thermography we’re able to detect: leaky plumbing, insulation deficiencies, moisture infiltration, and air infiltration. 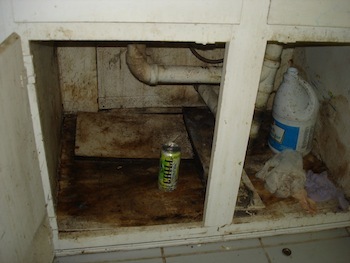 Call us for a free mold and water mapping consultation. Katch Environmental Vehicles We have vans, pick-up trucks, and semi-trucks. Our Final Tier 4 CAT Excavator can be used for any of your excavation or trenching needs. We have 10-yard and 40-yard roll-off bins for general waste, construction debris, or hazardous waste.